A simple, colorful and engaging parent guide with 16 important steps all parents need to know when preparing their children for kindergarten. A Road Map to Kindergarten© was designed to promote meaningful conversations between parents, educators, and community members about the importance of planning for and facilitating children’s smooth transitions into kindergarten. Our vision is to generate enthusiasm and a sense of collective responsibility for education and to increase the awareness of the importance of family partnerships and parent involvement in promoting children’s school readiness. 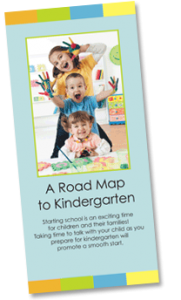 A Road Map to Kindergarten© is a parent education tool that is designed to be used interactively to enhance parent workshops, parent-teacher conferences or to be the focus of parent education events. It is not meant to be handed out or distributed without the accompanying active education component for parents. The Contra Costa LPC has developed a training module for anyone who is interested in using A Road Map to Kindergarten© to help parents support their child’s school readiness and transition to kindergarten. The training module is implemented in workshops that are run as facilitated discussions and that model the way in which A Road Map to Kindergarten© is intended to be presented to parents. The workshops are purposefully designed to invite conversation and to foster a sense of collaboration and partnership. Workshop participants review the components of A Road Map to Kindergarten© and develop their own action plans for how they will use it to help parents become active partners in their child’s education. Click here to download an outline of the training module. A Road Map to Kindergarten© is available in English and Spanish. 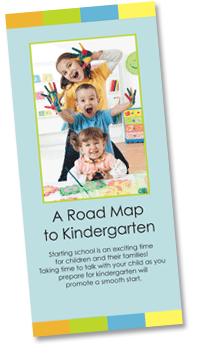 This seminar introduces participants to an attractive and easy to follow guide called A Road Map to Kindergarten©. The tool provides 16 important steps for parents to follow to prepare their child for a smooth start in school.